What's the Best Steam Curling Iron? You are here: Home / Curling irons & wands / What’s the Best Steam Curling Iron? Steam curling irons are really gaining in popularity! Relatively new to the hair tool marketplace they use different technology than regular curling irons. These new steam irons intend to deliver better looking curls, more shine, more definition and healthier looking hair. However, do they actually beat regular curling irons? We reviewed the options and selected the best options. Our top 3 choices are included below. A full review follows in the article. Steam curling irons pretty much have the same purpose as regular curling irons and that is to curl hair. The main difference is the technology used. With steam curling irons, it curls hair using heat and steam as opposed to other curling irons that only use heat. What Is A Steam Curling Iron? How do I use these irons? A steam curling iron looks much like a curling iron except it uses steam to heat up hair. It works similarly, in that you place hair in-between a barrel and a clamp, curling hair up as you let it travel through the hair. However, the main difference is these irons emit steam rather than dry heat. Additionally, you can use steam curling irons on damp hair so they are faster as they eliminate the need to dry hair before use. Using steam locks in moisture and hydration and doesn’t dry hair out as much as using dry heat through ceramic or tourmaline/titanium plates. That’s why this technology is rather exciting. These irons use a vapor infusion technology and this technology prevents heat damage which leaves hair feeling really silky and light. The steam appears in bursts and is so effective, that even the curliest, coarsest, frizziest hair relaxes and turns into curls. 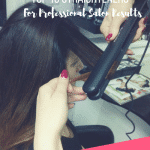 Generally, results are longer lasting than regular curling irons. There is a tank that needs to be filled up with distilled water before use. This creates the steam when heated up. Don’t use the steam curling irons without filling the chamber up with the distilled water first. Depending on the product you buy and the type of hair you have (length and texture), a tank of water will last anywhere between 10 and 20 minutes before it needs topping up. Using a steam curling iron is similar to using a regular curling iron. Many steam curling irons can be used on damp hair. The best way to use them is to firstly fill up the chamber with water, switch them on and select the right temperature for your hair. Even though these steam curling irons are kinder to hair than regular curling irons, they can still burn hair so always use a heat protectant spray before use. Once your steam curling iron is ready for action, divide your hair up into sections. Start at the back and wind hair from the root to the tip around the barrel of the steam curling iron. Gently pull the iron through the hair allowing it to work its magic and reveal a soft, shiny, bouncy curl. Repeat this all over and you should have the curls you’ve dreamt of! Essentially, both products look similar except the steam curling iron has a small area that is especially designed to hold distilled water. This area heats up when the steam curling iron is switched on and emits steam. The steam is what styles hair which is why it can be used on damp hair. Regular curling irons are not suitable for damp hair and must only ever be used on dry hair. The only inconvenience you have with a steam curling iron is the need to top up the water chamber every 10 to 20 minutes. If you have long, course hair you may have to top it up once during styling. Generally, it’s faster to style using a steam curling iron as you remove the need to have to dry hair first! Regular curling irons are usually made with coated titanium, tourmaline or ceramic. The barrel is heated up when the curling iron is turned on. There is no steam technology and the titanium, tourmaline or ceramic conducts heat onto hair, styling it as the curling iron passes through each section. You get a similar result with both, although the steam curling iron is believed to be better for hair as it uses moisture while styling so it won’t strip hair of its hydration. Some steam curling irons have additional chambers that are used to hold Argan oil. During the curling process, as well as steam being administered to hair, little drops of Argan oil are also distributed along each section to nourish hair. Steam curling irons can also use ionic technology, which banishes frizz as they emit negative ions into the atmosphere. Auto shut off will prevent any unwanted accidents. These models also usually include a set of temperature controls so you can use the right temperature for your hair type. If you do have course or long hair, look for a steam curling iron with a generously sized water chamber so you don’t have to keep filling it up. Remember to look for the right size steam curling iron for your hair type. If you have short hair you won’t want a large iron and if you have long hair, you’ll need something large enough to comfortably cope with length and thickness. I would say that a steam curling iron is better for you if you have chemically processed dry or damaged hair because it is much kinder. However, as with any hair tool, be mindful when using it and don’t go over and over areas as steam can still burn. Never over-use any hair tool and always use a heat-protectant spray before administering any heat to hair, steam or no steam! Err on the side of caution and only use it two or three times a week. 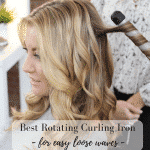 The steam curling iron is very advanced and users report that curls stay in place for longer than regular curling irons so you shouldn’t need to keep going over your hair. If you want to use your steam curling iron on damp hair, make sure that you buy the right type. Always use distilled water in the chamber and don’t be tempted to use your steam curling iron without any water inside. Use heat protectant spray and protect any surfaces you have with a heat mat. Always switch off after use and store away when your tool has cooled down. One of the main benefits of using steam curling irons is that it saves you an incredible amount of time when styling your hair. There’s no need to towel dry or blow dry, which can add damage to the hair too. Think of steam curling irons as steam irons that are used to press shirts. They don’t burn the cloth at all but what comes out is silky and softer clothing material. The same thing happens to your hair. Steam curling irons come in different sizes and designs as curling irons have different size barrels too. There are women who prefer tight curls so they buy the 1/4” barrel while others prefer bouncy and big curls so they opt for the 1” barrel. Moreover, steam curling irons can be made of ceramic tourmaline plates, gold plates and titanium plates. This product is slightly different than an iron as it has a pod at the end where you place hair. The steam technology then works its magic quickly to create a curl and the curl is released when it’s ready. With a 24 hour hold and great looking curls it’s a safe bet. This iron includes a good selection of different temperature settings and lets you know when it’s ready so you don’t have to worry about burning your hair. Instant heat up and silky-shine technology makes this one of the best steam curling irons on the market. This product is a good mid-price steam curling iron. It offers variable temperature settings and different time settings as well as ceramic tourmaline materials to further help conduct the heat. Useful for travel, the Natalie-Styx hair tool is dual voltage so can be used in Europe, Asia, North and South America too. This product includes an auto shut-off and an alarm to let you know when it’s ready. It creates gorgeous looking curls that really last. This steam curling iron features ionic technology to banish frizz and flyaway hair. With variable heat settings you can control the curling iron to suit your hair type and it delivers pretty curls that look healthy and shiny in moments. This option is similar to the BaByliss with its curling chamber at the end. You place hair inside the area, shut the lid and let it transform your hair. The spray technology works automatically and this product is suitable for all hair types as well as lengths. Developed with a timer, it lets you know when your curls are ready and with three heat settings, you choose the one to work with your hair. Additionally, this hair tool comes with 12 automatic timers and an LCD display so you can keep an eye on the temperature. It’s a great all-round steam curling iron. The BeQool uses the same BaByliss technology and heats up really quickly with variable temperatures so you have complete control. The chamber automatically draws hair inside and holds it until the curl is set, then releases a perfectly defined curl. With three timer settings and an alarm, you set the pace. You can also change the direction of your curls to get a more natural look and the LCD display means you can keep an eye on the temperature and the timing. If you’re looking for budget styling that delivers hydrated, healthy looking hair, this product ticks all the boxes! The Conair Infinitipro Steam Waver is a hair curler that uses heat and steam to achieve your desired waves. The steam mist adds moisture and a shiny gloss to the hair. It features an ion generator that helps fight frizz and smoothes hair cuticles. This iron features ceramic plates with no hot spots. Temperatures can reach up to 437 degrees Fahrenheit and it only takes 30 seconds to heat up. The Conair Infinitipro Steam Waver nourishes and moisturizes hair using hydrating steam mist. 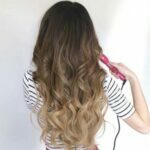 Women can enjoy big volume curls, shiny waves, beachy waves and different curling styles.